You can rely on the knowledge and experience of Jay Fencing Ltd. Feel confident that we will recommend only the fencing that meets your specific needs and budget. Careful consideration to community requirements, personal and property security, privacy, protected play for children and pets are all important issues that we will help you to examine. London Ontario custom gates, fencing, railing for residential commercial industrial. free estimate call 5196945510 or email info@fwcltd.ca. welding/mobile welding services available. Materials: wrought iron, metal, stainless steel, vinyl, aluminum, glass, cedar, wood, ornamental, modular. Riley Walsh Construction is dedicated to providing Stratford and area with fence, deck, post hole augering, and trenching services. Our crew strives to ensure each job is complete in good time and with excellent quality and customer satisfaction. Flawless Fence & Deck is a small business located in Woodstock Ontario that provides a wide range of quality fencing, deck and likewise project solutions to the home owners of Oxford County and surrounding area. From decks to fences to pergolas to accessibility ramps to sandboxes, we will do work that both us and the customer can take pride in. Ariss Fencing has been providing fencing services to both construction general contractors and residential home owners for over 25 years. Located in Ariss Ontario, Ariss Fencing serves reidental costomers in Ariss and surrounding areas including Guelph, Fergus, Cambridge and Kitchener. Your London, ON fence installation and repair professional will work with you to create your ideal fence. Find a fence contractor in London, ON on Houzz. 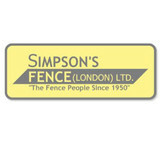 Narrow your search in the Professionals section of the website to London, ON fence contractors. You can also look through London, ON photos to find examples of fencing and gates that you like, then contact the professional who worked on them.